Christophe': Hello Adam! 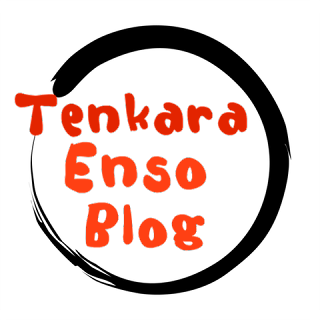 Many people in the tenkara community know you as you managed the Tenkara-Fisher Forum which was one of the very first website in the west dedicated to tenkara but as in the whole internet universe very few of us have ever met you in real life. Can you please introduce yourself? Adam: Hello Christophe’! Thank you for your time. My name is Adam Trahan and I live in Phoenix, Arizona. It is in the southwestern portion of the United States of America. I am the husband of a woman with a beautiful soul, the father of three great boys and I am the friend of many tenkara anglers in real life and in the virtual sense, all around the globe. I started fishing as a young child, my Grandfather, who didn’t like fishing, taught me with a cane pole. He knew that a young boy needed to know how to fish. This is the reason why I look at fishing with a pragmatic view. I’ve always fished my whole life also doing many other exciting sports along with having an interesting and intense career path. In 1995, two things happened that would alter the course of my life. I quit cross country hang gliding and I started creating a web site on small stream fly fishing. I used my love of fishing small streams to ignore the call of the sky. I dove into creating the best web site on this type of fishing with the help of many great anglers. My story of helping tenkara along comes from this same desire. Christophe': I have discovered tenkara through the Youtube videos of Masami Sakakibara and it was a kind of revelation. I realized quite fast that tenkara was exactly the fishing technique that was really what I was lookind for. How did you discover tenkara and what was your reaction then? Adam: I knew about tenkara long before most of the people in America but that is not when I discovered tenkara. About the same time I begain writing my web site on fly fishing small streams, Yoshikazu Fujioka started to make his. He and I began our online friendship then. Fujioka-san is a fly fisher that also does tenkara but his site started with fly fishing his favorite small streams. I learned about fly fishing as a boy of about 10, it was really simple for me, not the simple of today’s tenkara, simple in that I was not taught to shoot a line. I wasn’t given instruction so I just gripped the line in my hand and fished with the line about as long as the rod. That pragmatic approach to fishing is what I used to teach myself fly fishing as aboy. When I quit hang gliding, I was learning as an adult all the aspects of fly fishing, to really wring out the performance of a fly rod. I was learning about entomology, the history of fly fishing, about bamboo fly rods but focused on small streams as Fujioka-san was. 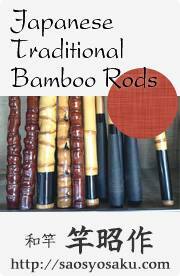 In 2009, I was deep into making bamboo fly rods. I I was learning from some of the best modern makers through another web site I created, www.grassart.net I was looking for a recipe for a long rod that I could create to fish like I did when I was a child. Tom Smithwick, a fellow bamboo fly rod maker suggested that I contact Daniel Galhardo. He was selling tenkara rods. So I called him and he set me up with an Ebisu. I found out about Masami and Ishigaki-sensei through Daniel but in my own research online, I found out about Kazuya Shimoda. 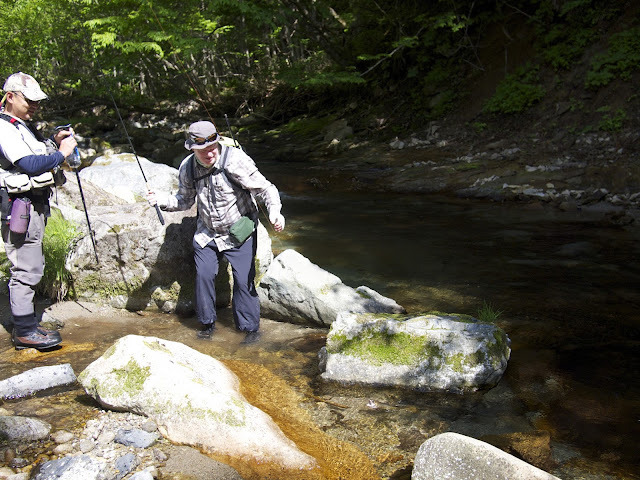 He is a genryu tenkara angler and he produced many videos on tenkara. So I began to follow him as well as the people Daniel was introducing tenkara outside of Japan. I knew about tenkara, genryu and sawanobori 23 years ago but it wasn’t until I got my own rod that I understood the precise performance in a short range tenkara rod. 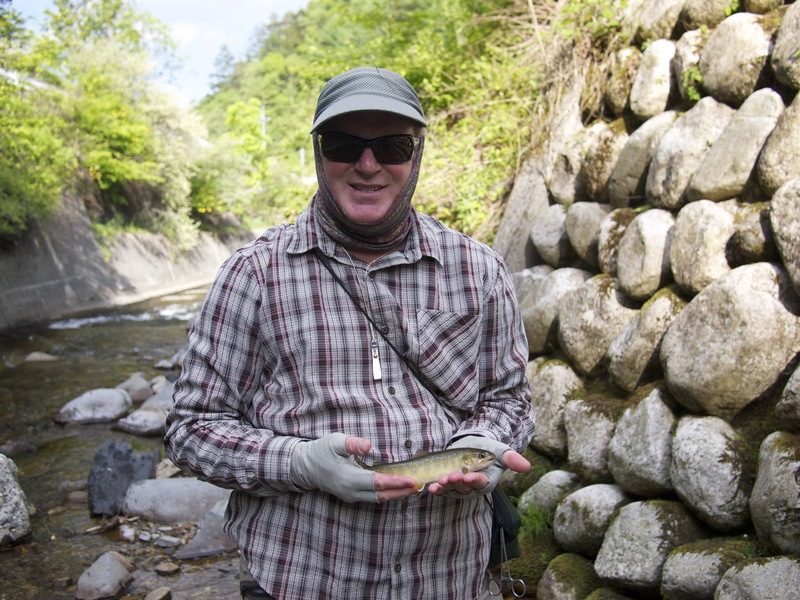 Christophe': You have traveled to Japan to meet Masami Sakakibara and Yuzo Sebata as well as their own "tenkara tribe"; how do you think these journeys have influenced you in your tenkara experience? Do you think that the people in western countries will ever be able to reach such a level of involvement in their own tenkara community? And also asuch a deep understanding of what tenkara can be for some people such Masami Sakakibara, Yuzo Sebata, Hisao Ishigaki and the generation that follows them. From my own experience I think that it will only exist on a very small scale gathering only the passionate tenkara anglers who will not jump in the wagon of the next fad in fly fishing world. Adam: To answer your question quickly but with meaning, I learn about the Japanese people and their culture more than anything else when I travel to Japan. For me, Japan and the tenkara anglers there will always be a part of my tenkara. With all due respect to all my friends and acquaintences, tenkara is now outside of Japan and the same passion can be found in France, Italy, America or South Africa. There are other countries too, passionate ambassadors. Tenkara is growing outside of Japan with the help of a lot of people around the globe. Perhaps they will find their way to the Japanese mountains and the anglers there as you and I have and to the mountain streams in their own country. Christophe': I am also a fishing gear minimalist and it does not only make my tenkara better, it also allows to carry some other kind of gear such as a camping stove, a reflex camera, a bottle of good beer. This equipment is useful to prepare a lunch break and also taking pictures of animals, mushrooms, etc. What is the typical non fishing gear you carry on a tenkara fishing trip? Adam: I have a few “types” of tenkara fishing trips that I take. It’s important to remember that tenkara, not the fishing method but the look at why tenkara is so appealing, this simple approach, the minimalism works in many different areas of life. Because I live in a city, the areas where I fish are diverse and the types of trips I take are also varied. For fishing the local ponds during the winter in my city, I take only my fishing gear. When I travel by car to the streams in our state, if I do a day trip, I often only take my fishing gear if I am only fishing less than two or less miles of stream. I might take a repurposed PTE bottle for water and a knife. For a day trip, I might take a daypack or a sling bag and in that, I might take a stove, cook pot, a repurposed PTE bottle of water, ramen, my little emergency essentials ditty bag, a sit pad and my Sake flask. For a camping overnight trip, I will take my pyramid style tent with netting, a efficient sleep pad, my quilt, dehydrated meals, stove or lightweight grill, a small folding saw, a lightweight “sink” for clean up and fire dousing, a micro table, a small headlamp, and a few personal effects as well as stuffable down puffy jacket. When I travel by plane to a destination, my gear is not the same as my camping gear. I do not want to appear as a camper in my destination city. I use gear that is designed for multi-purpose. I use a backpack that has no outside pockets, it is easy to stuff into an overhead bin or under a seat. It is maximum legal airline carry on, I do not check my baggage. So my backpack is airline friendly in that it has handles on each side and the comfortable straps are stowable. My pants have a durable water repellant finish and do not hold water or odors. I use merino wool, performance clothes that can go a few days without looking dirty or worn. If I am camping, I use the tent, pad and quilt, the same utilities for eating. My tenkara gear changes once I get on a plane, I use very compact rods so that I can put them inside my bag and forget them until I am fishing. I’ve learned very much about what I don’t need with a minimalist view that I found out about from learning tenkara. Christophe': In your tenkara experience you have tested a whole lot of gear as some of us also have; do you think that it has brought you what you were looking for? What is your favorite tenkara gear set today? Adam: For a while, I made it a purpose to learn the different tenkara experts style by using their rods and setting them up the way they used them. Rods by Masami Sakakibara, Hisao Ishigaki and Yuzo Sebata. My “work rods” are the Ito from Tenkara USA, that and the Sato gets used hard. The Rhodo is a tight quarters casting rod that I beat against the trees, that is a really well thought out rod. I use these because they are rods from a friend and from the company I learned tenkara with. 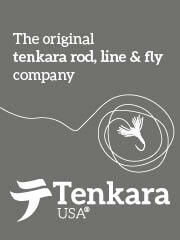 They are also the rods I suggest to new tenkara anglers. Sometimes I use my Sakura Sekirei because it has been around for a long time and is my first rod from Japan and excellent quality. I really like it. 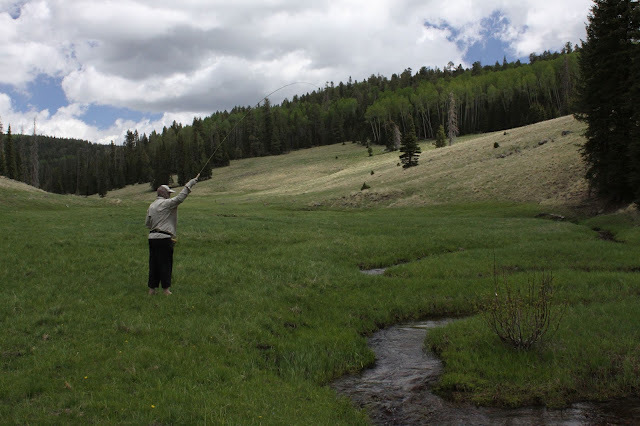 Early Tenkara fishing in AZ, this is a high mountain stream we call "Brookville"
Christophe': I have seen your reports on your blog and I had not imagined this state had these beautiful mountain meadows and forests, what is tenkara fishing like in Arizona? Adam: Arizona has a stigma for being a desert. The Grand Canyon, spaghetti westerns, media associates Arizona with cactus and deserts. The thing of Arizona, we have mountains and snow! Our highest mountain is nearly 13,000’ and we have several mountain ranges above 7,000’ and a great portion of the state is above 5,000’ which is about the elevation that sustains a cold water trout stream. We have the largest ponderosa pine forest in the country! Our forests are varied, blue spruce, aspens, all kinds of trees and we even have a world famous for fly fishing tailwater river that carves canyons through solid rock, Lees Ferry in Marble Canyon, part of the Grand Canyon complex of the Colorado River!If you don’t mind, I would like to back up a little. I learned about the *Rosgen Stream Classification System decades ago. It is a system that classifies the different types of streams. In fly fishing and tenkara, there are many enthusiasts that struggle to understand stream types so I use the Rosgen system, it seems to work pretty well. Some of my favorite alpine streams are in meadows high on a mountain. 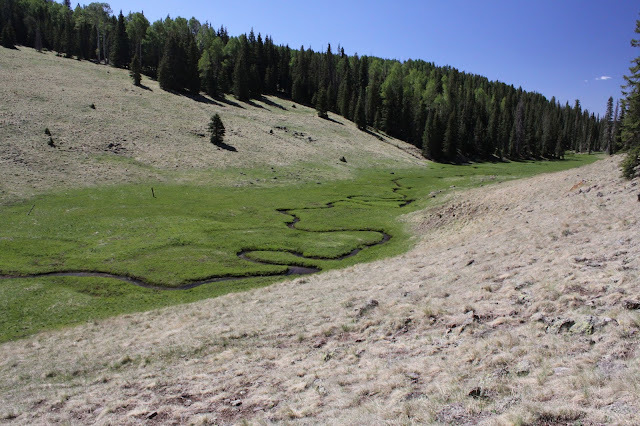 These high mountain flat bottom valleys promote tiny streams that meander slowly winding back and forth on itself. Sometimes changing course completely over the course of a season. These streams are just a few feet wide and half as deep. Undercut banks with grass lining the stream. These streams go through open areas and then get pinched off by the steep sided valley, drop in elevation in these pinches then open up again. Typically, these streams breed trout (brook or brown) that were planted long ago. The game and fish organization often changes the population of a stream to meet the needs of their studies. Lately there have been efforts to grow the population of our native species, the Apache and Gila trout which are not my favorite. My favorite being brook trout, the reason being, they refuse to live in ugly places. Oak Creek, one of my favorites is managed as a put and take rainbow trout fishery. It is a stream that I have been fishing for about 50 years off and on. It runs through Sedona, red rock country and I can get there in about an hour and a half. If it is 115 degrees in Phoenix where I live, I can drive up before the sun rises and bask in the 50 degrees of the deep canyon, catching the wild brown trout to 20+” and then turn around and be back home by early afternoon. I do this a few times over the course of the year, it’s one of my home streams and if I am catching the browns there, I’m doing well. I have helped many people through to the next level in their fishing by showing them the gentle and generous side of Oak Creek. 20 years ago I went through a decade of explore the high mountain streams phase that took long drives and then long hikes to get through. Secret streams that weren’t so secret, a fly fishing snob I was, knowing I held the key to being a expert. It’s so funny, I now fish the stocked ponds in Phoenix in the winter! Sometimes those damn fish have beat me! I drive 10 minutes a couple of times a week and chase these hatchery trout, some of them very big. I love fishing now, more than ever and I’m not beyond that scenario for fishing with a good friend or teaching a new angler. 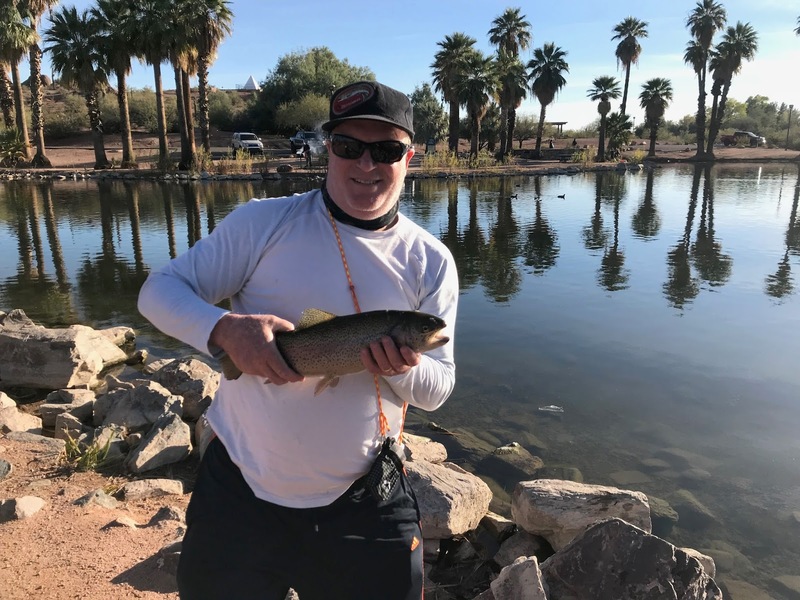 Arizona has wonderful fishing opportunities year round. Cold water, warm water, 3.5 hours south we have the Sea of Cortez, a world class salt water fishery. We have fishing, you just need to use the windshield time in your car to realize it.f trees and we even have a world famous tailwater river that carves canyons through solid rock, the Grand Canyon! Christophe': Do you plan to travel to other places than Japan in the future for your tenkara experience? I know that you are a wine amateur, especially Bourgogne wines, so perhaps you would appreciate to discover France for its trout streams and of course the gastronomy? Or perhaps Italy and the people who keep the legacy of valsesiana style of fishing alive? I’ve been to Japan three times now, twice for fishing, my funds are limited for travel and a big trip like this is years in the planning for me. I do have plans to return but not as I have done in the past. I really want to visit Yoshikazu Fujioka and Yoshida Takashi and go through his day one school. He is responsible for many many people learning tenkara in Japan and his voice is largely missing here. The same with Kazuya Shimoda, I would really like to visit him too. I love visiting Japan but it is difficult as I have friends all over and I want the experience of visiting the big circle of friends, not just the same ones over and over. With respect, I like the community aspect, not just one single group, all of my friends there, I want to visit. My style of Japanese tenkara is not one group, it is community, a broad range of styles have influenced me, not just one group. I was invited to go to South Africa to give a talk to an old club there when I was fishing small streams with a fly rod. I kick myself for not taking that offer up. I want to go to South Africa like nobodys business. The quality of streams is outstanding there, the community is old, focused and keen. I have friends there and helped get tenkara started in this country. I will go there in some fishing and tourist capacity one day. I’m going to do it, I missed my first chance but I will make that up. I would be careful how you approach me about visiting France. This is how my trips start, with a mention in a conversation, that spark grows into a fire that burns hot inside of me. Yes, you know I love Jadot and yes, I want to visit France, those those mountain towns where many of the dreams you see in crazy sports are being lived by focused extreme athletes. It is my TARGET for the next adventure. Are you inviting me? Christophe': Tenkara has been spreading in the west since 2009 and now there are tenkara anglers in real unexpected places such as Brazil, Iran, Israel, Morocco, South Africa (and many others) but tenkara remains a controversial topic in the fishing galaxy. What is your idea of the development of tenkara in the future? As you know, I enjoy creating these interviews such as yourself. I create them just as much for myself, to learn from my subject and I share them if people what to read them. In 2012, I interviewed Masami Sakakibara just as I interviewed you in 2015. I ask questions that I want to know about so that I learn and share with whoever wants to learn with me. I asked Masami what his definition of tenkara is and he responded with the following. I’m an American living in the Southwest portion of the USA. Although I travel to Japan and I practice tenkara, which I call Japanese style fly fishing out of respect to the Japanese and their contribution to the whole of fly fishing, I am not authentic. Unless I live in Japan and fish the streams there with a rod, line and fly, I’m just doing it my way. Tenkara is outside of Japan. Consumerism is part of the Japanese and American society. 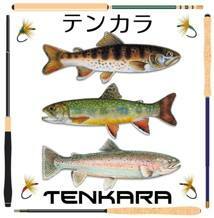 Marketing is part of the tenkara fishing community. For my example, I learned about tenkara from Tenkara USA. This new form of fishing fit perfectly into the evolution of my fishing. 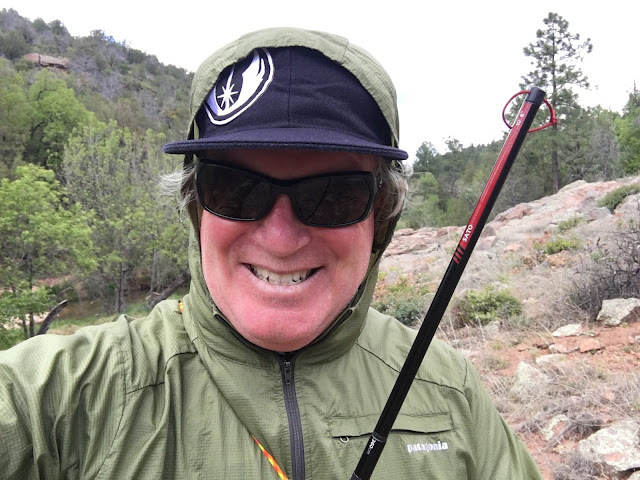 As a fisherman, already I was developing interest in the method that Yvon Chouinard has made popular now, “simple fly fishing” and I wrote about that long before the marketing that Yvon and Patagonia have used in bringing their rods to market. This simple fly fishing was what I was doing on small streams only, not in the ocean and certainly not on tailwaters. Daniel Galhardo is a kind and gentle person and his marketing techniques are oddly brilliant. He shows you in his way what tenkara is with a soft touch and an aesthetic that is what what I want in my fishing. He also educates anglers on the background of tenkara through the voices of the Japanese anglers sharing their methods. Daniel’s demeanor in sharing tenkara is kind, softspoken and he creates a gentle community, perfect for learning tenkara. Recently I have experience the wrath of tenkara marketing and I if I was mean or hateful, I would expose it here but I am not. I know that I have a tendency to overthink and I am human and often make mistakes. So I will not write about what I think is wrong, I’ll keep centered on what is right. Unless you are Japanese, practicing tenkara with a rod, line and fly, catching fish and selling them, you are not doing authentic tenkara. In my understanding from Japanese anglers, journalists, enthusiasts, books and media, this is where tenkara was formulated. Everything after that is an interpretation, even in Japan. In Japan, the tenkara community is a small portion of the whole of fly fishing there. In the Japanese fishing community, there is a western influence just as there is a Japanese influence on tenkara as it is practiced outside of Japan. When a person picks up a tenkara rod, line and fly outside of Japan, it is his or her decision on how to practice it, NO ONE ELSE. It’s a choice. My choice is my way, as an American, sharing and supporting tenkara in the fashion that you read here. It is your choice to do it as you please. It is your decision where to get your information, it is your decision on how to practice it. In no way do I want to place my own “spin” on tenkara. That’s why I quit fly fishing, I didn’t want tenkara to be “simple fly fishing” for me, and that is what it is to some and I respect that. To me, tenkara is mountain stream fishing for trout, I also use it for still waters for trout and down in the cities and desert areas I use it for trout in season and panfish out of season. This is the tenkara I practice. From my understanding, from traveling to Japan, interviewing tenkara anglers from all over Japan, not just one area, I’m getting a good version of it and I’ve developed my own practice of it from this method of self teaching. I promote Tenkara USA as the equipment and education for people that I teach because from day one, Daniel Galhardo got it right. His methods have created a very kind and gentle community which I find appealing. If someone wants a Japanese rod, I will help them with one from Sakura, the old rod shop and brand that has supported tenkara in Japan from day one. They chose me to help them promote their craft outside of Japan. Sakura rods are one of the oldest tenkara brands in Japan and I am proud to be a part of them as an ambassador to that brand. I sold many early adopters of tenkara back in 2010 on, their first Japanese rod. If someone wants another Japanese tenkara rod, I suggest they visit Keiichi Okushi of Tenkaraya. He is a life long genryu angler and knows all the equipment and techniques from Japan. He approached me to help him with his shop which on it’s own was one of the highlights of my tenkara. That and getting my first rod from Tenkara USA, meeting many of the Japanese teachers and being invited to fish many of the central mountain areas of Japan. So my idea of the development of tenkara in the future has not changed since day one because tenkara in Japan has changed very little. But once tenkara leaves Japan, as Masami has said, it is up to the person practicing it to do it as he or she pleases. With the help of tenkara ambassadors such as yourself, Isaac Tait and other kind people above as I mention, tenkara will live as a gentle way to explore the waters we enjoy. There are many others that promote tenkara that are kind and gentle, too many to put into this interview which has already very long. Christophe': Thank you very much Adam for your very interesting points of view about everything Tenkara; you are one of the most passionate Tenkara ambassador out there. I let you the freedom to conclude this interview the way you will. Adam: The pleasure is mine Christophe. If you choose to visit my area, you are welcome in my home. I want you to know that I have enjoyed your participation in tenkara in social media and on the internet since you have begun doing it. You are a kind soul, the world in general needs more people like you. As far as tenkara is concerned, there are a couple of good ways to improve your tenkara and have a really fun time doing it. Getting to one of the Oni School’s that John Vetterli hosts would be a solid way to interface with Masami Sakakibara, a Japanese tenkara expert. His instruction will absolutely improve your tenkara. The Tenkara USA summit is a big event, much in the way of Japanese tenkara is themed here along with American tenkara experts. The Tenkara USA summit is a super fun event. Christophe’Laurent, thank you for your dedication and your kindness in helping anglers learn and share tenkara, you my friend are the best at doing that. Christophe: Bonjour Adam! Beaucoup de gens dans la communauté tenkara te connaissent parce ce que tu as créé le forum Tenkara-Fisher qui était l'un des tout premiers sites occidentaux dédiés au tenkara mais comme dans tout l'univers virtuel d'internet, très peu d'entre nous t'ont rencontré dans la vie réelle. Peux-tu s'il te plaît te présenter aux lecteurs? Adam: J'ai commencé à pêcher enfant, mon grand-père, qui n'aimait pas pêcher, m'a appris avec une canne au coup. Il savait qu'un jeune garçon devait savoir pêcher. C'est la raison pour laquelle je regarde la pêche avec une vision pragmatique. J'ai pêché toute ma vie en faisant beaucoup d'autres sports passionnants en ayant un parcours intéressant et intense. En 1995, deux choses sont arrivées qui allait changer le cours de ma vie. J'ai arrêté le vol libre et j'ai commencé à créer un site internet sur la pêche à la mouche. J'ai utilisé mon amour de la pêche dans les petits ruisseaux pour ignorer l'appel du ciel. J'ai plongé dans la création du meilleur site web sur ce type de pêche avec l'aide de nombreux grands pêcheurs. Mon désir d'aider le développement du tenkara vient de ce même désir. Christophe: J'ai découvert le tenkara à travers les vidéos de Masami Sakakibara diffusées sur Youtube et c'était une sorte de révélation. Je me suis vite rendu compte que le tenkara était exactement la technique de pêche qui était vraiment ce que je recherchais. Comment as-tu découvert le tenkara et quelle a été ta réaction alors? Adam: Je connaissais le tenkara bien avant la plupart des gens en Amérique mais ce n'est pas alors que j'ai découvert le tenkara. A peu près au même moment où j'ai commencé à écrire mon site web sur la pêche à la mouche des petits cours d'eau, Yoshikazu Fujioka a commencé à faire son site internet. Lui et moi avons commencé notre amitié en ligne alors. Fujioka-san est un pêcheur à la mouche qui pratique aussi le tenkara mais son site a commencé avec la pêche à la mouche de ses petits ruisseaux préférés. J'ai appris la pêche à la mouche étant enfant d'environ 10 ans, c'était vraiment simple pour moi, pas aussi simple que le tenkara d'aujourd'hui, simple en ce sens qu'on ne m'a pas appris à lancer une ligne. Je n'ai pas reçu d'instruction alors j'ai juste saisi la ligne dans ma main et pêché avec la ligne à peu près aussi longue que la tige. Cette approche pragmatique de la pêche est la façon dont j'ai appris à pêcher à la mouche en tant que jeune garçon. Quand j'ai arrêté le deltaplane, j'ai appris en tant qu'adulte tous les aspects de la pêche à la mouche, pour vraiment exploiter la performance d'une canne à mouche. J'ai appris l'entomologie, l'histoire de la pêche à la mouche, sur les cannes à mouche en bambou, mais je me suis concentré sur les petits cours d'eau comme le faisait Fujioka-san. En 2009, j'étais investi dans la fabrication de cannes à mouche en bambou. J'ai appris de certains des meilleurs fabricants modernes à travers un autre site web que j'ai créé, www.grassart.net. Je cherchais une recette pour une longue tige que je pourrais créer pour pêcher comme je l'ai fait quand j'étais un enfant. Tom Smithwick, un fabricant de cannes à mouche en bambou, m'a suggéré de contacter Daniel Galhardo. Il vendait des cannes de tenkara. Alors je l'ai appelé et il m'a proposé la canne Ebisu. J'ai découvert Masami et Ishigaki-sensei par Daniel mais dans ma propre recherche en ligne, j'ai découvert Kazuya Shimoda. Il est un pêcheur de genryu tenkara et il a produit beaucoup de vidéos sur le tenkara. Alors j'ai commencé à le suivre alors que Daniel introduisait le tenkara à l'extérieur du Japon. Je connaissais le tenkara, le genryu et le sawanobori il y a 23 ans mais ce n'est que lorsque j'ai eu ma propre canne que j'ai compris la performance d'une canne tenkara à courte portée. Christophe: Tu as voyagé au Japon pour rencontrer Masami Sakakibara et Yuzo Sebata ainsi que leur propre «tribu tenkara»; penses-tu que ces voyages t'ont influencé dans votre expérience de tenkara? Pensez-vous que les gens dans les pays occidentaux seront un jour capables d'atteindre un tel niveau d'implication dans leur propre communauté de tenkara? Et aussi une compréhension profonde de ce que peut être le tenkara pour certaines personnes telles que Masami Sakakibara, Yuzo Sebata, Hisao Ishigaki et la génération qui les suit. De ma propre expérience, je pense qu'elle n'existera que sur une très petite échelle réunissant seulement les pêcheurs tenkara les plus passionnés qui ne sauteront pas dans le train de la prochaine mode dans le monde de la pêche à la mouche. Adam: Pour répondre rapidement à ta question mais avec sens, j'apprends plus sur les Japonais et leur culture que tout au long de mon voyage au Japon. Pour moi, le Japon et les pêcheurs au tenkara de là-bas seront toujours une partie de mon tenkara. Avec tout le respect dû à tous mes amis et connaissances, le tenkara est maintenant connu hors du Japon et la même passion peut être trouvée en France, en Italie, en Amérique ou en Afrique du Sud. Il y a aussi bien d'autres pays, des ambassadeurs passionnés. Le tenkara se développe à l'extérieur du Japon avec l'aide de beaucoup de gens autour du globe. Christophe: Comme toi je suis aussi un minimaliste et cela ne fait pas que rendre mon tenkara meilleur, cela permet aussi de transporter d'autres matériels tels qu'un réchaud, un appareil photo reflex, une bouteille de bonne bière. Cet équipement est utile pour préparer une pause déjeuner et prendre des photos d'animaux, de champignons, etc. Quel est le matériel en dehors de celui utile à la pêche que tu transportes lors d'une sortie de pêche au tenkara? Adam: Il y a plusieurs "types" de sorties de pêche tenkara que je fais. Il est important de se rappeler que le tenkara, pas la méthode de pêche, mais le regard sur pourquoi tenkara est si attrayant, cette approche simple, le minimalisme fonctionne dans de nombreux domaines différents de la vie. Parce que je vis dans une ville, les zones où je pêche sont diverses et les types de voyages que je prends sont également variés. Pour pêcher les étangs locaux pendant l'hiver dans ma ville, je prends seulement mon équipement de pêche. Lorsque je me rends en voiture sur les rivières de notre état, si je fais une excursion d'une journée, je prends souvent mon équipement de pêche seulement si je ne pêche que moins de deux milles ou moins de cours d'eau. Je pourrais prendre une bouteille en plastique pour l'eau et un couteau. Pour une excursion d'une journée, je pourrais prendre un sac à dos ou un sac en bandoulière (un Zimmerbuilt) et dans ce cas, je pourrais prendre un poêle, une gamelle de cuisine, une bouteille d'eau recyclée, des ramen, une pochette de matériel de secours et ma bouteille de sake. Pour un voyage comprenant une nuit en camping, je prendrai ma tente de style pyramide avec son filet, un matelas de nuit efficace, mon duvet, des repas déshydratés, une cuisinière ou un grill léger, une petite scie pliante, un léger "évier" pour nettoyer et éteindre le feu, une micro table, une petite lampe frontale, quelques effets personnels ainsi qu'une veste à duvet. Lorsque je voyage en avion vers une destination, mon équipement n'est pas le même que mon équipement de camping. Je ne veux pas apparaître comme un campeur dans ma ville de destination. J'utilise des équipements conçus pour de multiples usages. J'utilise un sac à dos qui n'a pas de poches extérieures, il est facile de le fourrer dans un bac à bagages ou sous un siège. Il fait la taille maximum autorisée par les compagnie aériennes, je n'ai ainsi pas à vérifier mes bagages. Donc, mon sac à dos est pratique pour les compagnies aériennes en ce qu'il a des poignées de chaque côté et les bretelles sont confortables et escamotables. Mes pantalons ont une finition hydrofuge durable et ne retiennent pas l'eau ou les odeurs. J'utilise de la laine mérinos, des vêtements performants qui peuvent passer quelques jours sans avoir l'air sales ou froissés. Si je fais du camping, j'utilise une tente, un matelas et un duvet, les mêmes équipements pour manger. Mon équipement de tenkara change une fois que je monte dans un avion, j'utilise des cannes très compactes pour que je puisse les mettre dans mon sac et ne plus y penser jusqu'à ce que je pêche. J'ai beaucoup appris sur ce dont je n'ai pas besoin grâce à une approche minimaliste que j'ai apprise en apprenant le tenkara. Christophe: Dans ton expérience du tenkara, tu as testé beaucoup d'équipement comme certains d'entre nous ont aussi; penses-tu que cela t'a apporté ce que tu cherchais? Quel est aujourd'hui ton matériel de tenkara favori? Adam: Pendant un certain temps, je me suis donné pour objectif d'apprendre le style des différents experts du tenkara en utilisant leurs cannes et en les utilisant comme ils le font. Les cannes de Masami Sakakibara, Hisao Ishigaki et Yuzo Sebata. Mes "cannes de travail" sont les Ito de Tenkara USA, et la Sato que j'utilise beaucoup. La Rhodo est une canne pour les petits espaces, c'est une canne très bien pensée. Je les utilise parce que ce sont des cannes créées par un ami et de la compagnie avec laquelle j'ai appris le tenkara. Ce sont aussi les cannes que je suggère aux nouveaux pêcheurs au tenkara. Parfois, j'utilise ma Sakura Sekirei car elle existe depuis longtemps et c'est ma première canne japonaise et elle est d'excellente qualité. J'aime vraiment cette canne. Christophe: J'ai lu tes récits de pêche sur ton blog et je n'avais pas imaginé que l'Arizona avait ces belles prairies de montagne et des forêts aussi étendues, à quoi ressemble la pêche Tenkara en Arizona? Adam:L'Arizona est étiqueté comme un désert. Le Grand Canyon, les westerns spaghetti, les médias associent l'Arizona aux cactus et aux déserts. Le fait est qu'en Arizona, nous avons des montagnes et de la neige! Notre plus haute montagne culmine à près de 4000 mètres et nous avons plusieurs chaînes de montagnes au-dessus de 2000 mètres et une grande partie de l'état a une altitude supérieure à 1500 mètres ce qui correspond à l'altitude qui permet l'existence de cours d'eau froide. Nous avons la plus grande forêt de pins ponderosa du pays! Nos forêts sont variées, épinettes bleues, trembles, arbres de toute sortes et nous avons même une rivière mondialement célèbre pour la pêche à la mouche qui a sculpté des canyons à travers la roche solide, Lees Ferry du Marble Canyon, partie du complexe du Grand Canyon du Colorado! Certains de mes ruisseaux alpins préférés sont dans les prés d'altitude. Ces vallées de haute montagne à fond plat favorisent la formation de minuscules ruisseaux qui serpentent lentement en méandres. Parfois ils changent complètement de cap au cours d'une saison. Ces cours d'eau n'ont que quelques pieds de largeur et très peu de profondeur. De l'herbe haute entoure ces ruisseaux. Ces cours d'eau traversent des zones ouvertes et se réduisent dans la partie de la vallée la plus escarpée, ils descendent dans ces vallées puis s'élargissent à nouveau. Généralement, ces cours d'eau abritent des truites (saumons de fontaine et fario) qui ont été implantées il y a longtemps. Les instances de la pêche modifient souvent la population de salmonidés d'un cours d'eau pour répondre aux besoins de leurs études. Dernièrement, il y a eu des efforts pour faire croître la population de nos espèces indigènes, les truites Apache et Gila, qui ne sont pas mes préférées. Mon favori étant l'omble de fontaine, la raison étant qu'il refuse de vivre dans des endroits laids. Oak Creek, l'un de mes favoris est géré comme une pêcherie à la truite arc-en-ciel. C'est un cours d'eau que je pêche depuis environ 50 ans. Il traverse Sedona, pays de roche rouge et je peux y arriver en environ une heure et demie de voiture. S'il fait 46 degrés à Phoenix où je vis, je peux y monter avant que le soleil se lève et profiter d'une température d'environ 10 degrés au fond du canyon, y pêcher des fario sauvages mesurant jusqu'à 50 centimètres et puis rentrer à la maison en début d'après-midi . Je fais cela quelques fois au cours de l'année, c'est l'un de mes ruisseaux préférés et si j'attrape des fario, je vais bien. J'ai aidé beaucoup de gens à passer au niveau supérieur dans leur pêche en leur montrant le côté doux et généreux de Oak Creek. Il y a 20 ans, j'ai traversé une décennie d'exploration des ruisseaux de haute montagne ce qui a nécessité de longs trajets puis de longues randonnées. Des ruisseaux secrets qui n'étaient pas si secrets pour le snob de la pêche à la mouche que j'étais, sachant que je détenais la clé pour devenir un expert. C'est tellement marrant de pêcher maintenant les étangs de Phoenix en hiver! Parfois ces foutus poissons m'ont vaincu! Je conduis une dizaine de minutes une ou deux fois par semaine et je traque ces truites d'élevage, dont certaines sont très grosses. J'aime pêcher maintenant, plus que jamais et je ne suis pas hostile à aller pêcher avec un bon ami ou enseigner à un nouveau pêcheur. L'Arizona offre de merveilleuses opportunités de pêche toute l'année. L'eau froide, l'eau chaude, à 3 heures et demies de route vers le Sud nous avons la mer de Cortez, une opportunité de pêche en mer de classe mondiale. Nous avons de la pêche, il suffit de consacrer un peu de temps à la conduite pour le réaliser. Nous avons même une rivière mondialement connue qui sculpte des canyons à travers la roche solide, le Grand Canyon! Christophe: As-tu l'intention de voyager vers d'autres destinations que le Japon à l'avenir dans ton expérience du tenkara? Je sais que tu es un amateur de vin, surtout de Bourgogne, alors peut-être aimerais-tu découvrir la France pour ses truites et bien sûr la gastronomie? Ou peut-être l'Italie et les gens qui gardent l'héritage du style de pêche valsesiana vivant? Je suis allé au Japon trois fois jusqu'à maintenant, deux fois pour la pêche, mes fonds sont limités pour voyager et un grand voyage comme celui-ci demande des années de préparation pour moi. J'ai prévu de revenir mais pas comme je l'ai fait dans le passé. Je veux vraiment rendre visite à Yoshikazu Fujioka et Yoshida Takashi et passer par son école en tant que débutant. Il est responsable du fait que beaucoup de gens qui apprennent le tenkara au Japon et sa voix est largement absente ici. La même chose avec Kazuya Shimoda, j'aimerais vraiment lui rendre visite aussi. J'adore visiter le Japon mais c'est difficile car j'ai des amis partout et je veux avoir l'expérience de visiter un grand cercle d'amis, pas seulement les mêmes encore et encore. En toute déférence, j'aime l'aspect communautaire, j'aime visiter mes amis et pas seulement un groupe . Mon style de tenkara japonais n'est pas limité à un groupe, c'est une communauté, un large éventail de styles m'a influencé, pas seulement un groupe. J'ai été invité à aller en Afrique du Sud pour parler à un vieux club quand je pêchais de petits ruisseaux avec une canne à mouche. Je m'en veux de ne pas à avoir répondu à cette offre. Je veux aller plus que quiconque en Afrique du Sud . La qualité des cours d'eau y est exceptionnelle, la communauté de la pêche est ancienne, concentrée et passionnée. J'ai des amis là-bas et j'ai aidé à faire démarrer le tenkara dans ce pays. J'irai un jour pour la pêche et le tourisme. Je vais le faire, j'ai raté ma première chance mais je vais le faire. Je fais attention à ton approche à propos d'une visite en France. C'est ainsi que mes voyages commencent, avec une mention dans une conversation, que l'étincelle se développe dans un feu qui brûle chaud à l'intérieur de moi. Oui, tu sais que j'aime les vins Jadot et oui, je veux visiter la France et ses villages de montagne où beaucoup de rêves dans les sports extrêmes sont réalisés par des athlètes extrêmes. C'est ma cible pour la prochaine aventure. Est ce que tu m'invites? Christophe: Bien sûr que c'est une invitation! Le tenkara s'est répandu en occident depuis 2009 et maintenant il y a des pêcheurs au tenkara dans des endroits vraiment inattendus comme le Brésil, l'Iran, Israël, le Maroc, l'Afrique du Sud (et beaucoup d'autres) mais le tenkara reste un sujet de controverse dans la galaxie de la pêche à la mouche. Quelle est ton idée du développement de tenkara dans le futur? Comme tu le sais, j'aime faire des interviews comme vous. Je les crée tout autant pour moi-même, pour apprendre de mon sujet que pour les gens qui les lisent. Masami Tenkarano-oni Sakakibara: Je pense que le tenkara est la pêche dans les beaux torrents de montagne du Japon, pour nos belles truites indigènes qui les habitent. Pourtant, aujourd'hui, le tenkara semble s'étendre aux États-Unis, en Europe et plus encore. Je suis sûr qu'ils ont aussi de belles rivières et ruisseaux, avec de belles truites ou d'autres poissons qui les habitent. Ainsi, une fois que le tenkara a quitté le Japon, ou qu'il entre dans un autre pays et une autre culture, les gens qui prennent une canne tenkara ont le droit et l'obligation de décider ce que Tenkara est pour eux. Ce n'est certainement pas à moi de décider. Je suis un Américain vivant dans la partie sud-ouest des États-Unis. Bien que je voyage au Japon et que je pratique le tenkara, que j'appelle la pêche à la mouche de style japonais par respect pour les Japonais et leur contribution à la pêche à la mouche, je ne suis pas authentique. À moins de vivre au Japon et de pêcher dans ses rivières avec une canne, une ligne et une mouche, je le fais à ma façon. C'est ce que j'aime à propos de Tenkara, c'est une forme simple mais efficace de pêche à la mouche. C'est aussi pourquoi je dis que "Tenkara est facile à apprendre, difficile à maîtriser et la pêche à la mouche est difficile à apprendre, facile à maîtriser." Le tenkara vit en dehors du Japon. Le consumérisme fait partie de la société japonaise et américaine. Le marketing fait partie de la communauté de pêche tenkara. Pour mon exemple, j'ai appris le tenkara par le biais de Tenkara USA. Cette nouvelle forme de pêche s'intègre parfaitement dans l'évolution de ma pêche. En tant que pêcheur, je m'intéressais déjà à la méthode que Yvon Chouinard a popularisée maintenant, la «pêche à la mouche simple» et j'en ai parlé longtemps avant la commercialisation qu'ont utilisée Yvon et Patagonia pour commercialiser leurs cannes. Cette pêche à la mouche simple était ce que je faisais sur les petits ruisseaux seulement, pas dans l'océan et certainement pas sur les queues de bassins. Daniel Galhardo est une personne gentille et douce et ses techniques de marketing sont étrangement brillantes. Il vous montre à sa manière ce qu'est le tenkara avec un approche douce et une esthétique qui est ce que je veux dans ma pêche. Il éduque également les pêcheurs sur le tenkara à travers les voix des pêcheurs japonais qui aiment partager leurs méthodes. Le comportement de Daniel dans le partage de tenkara est d'être gentil, courtois et il crée une communauté parfaite pour apprendre le tenkara. Récemment, j'ai expérimenté la colère à propos du marketing tenkara et si j'étais méchant ou colérique, je l'exposerais ici mais je ne le suis pas. Je sais que j'ai tendance à trop penser et que je suis humain et que je fais souvent des erreurs. Donc, je ne vais pas écrire sur ce que je pense est faux, je vais rester centré sur ce qui est juste. A moins que vous ne soyez Japonais, en pratiquant le tenkara avec une canne, une ligne et une mouche, en attrapant du poisson et en le vendant, vous ne faites pas de tenkara authentique. D'après ce que j'ai compris des pêcheurs japonais, des journalistes, des amateurs, des livres et des médias, c'est là que le tenkara a été défini. Après, cela est une interprétation, même au Japon. Au Japon, la communauté tenkara est une petite partie de l'ensemble de la pêche à la mouche. Dans la communauté de pêche japonaise, il y a une influence occidentale tout comme il y a une influence japonaise sur le tenkara tel qu'il est pratiqué en dehors du Japon. Quand une personne prend une canne de tenkara, une ligne et une mouche à l'extérieur du Japon, c'est à elle de décider la façon de la pratiquer, de personne d'autre. C'est un choix. Mon choix est à ma façon, en tant qu'américain, de partager et de soutenir tenkara à la manière que vous lisez ici. C'est votre choix de le faire à votre guise. C'est votre décision d'obtenir des informations, c'est votre décision sur la façon de la pratiquer. Je ne veux en aucun cas placer ma propre "touche" sur le tenkara. C'est pourquoi j'ai arrêté de pêcher à la mouche, je ne voulais pas que le tenkara soit une «pêche à la mouche simple» pour moi, et c'est ce que c'est pour certains et je respecte cela. Pour moi, le tenkara c'est un ruisseau de montagne pour pêcher la truite, je l'utilise également pour les eaux tranquilles pour la truite et dans les villes et les zones désertiques. Je l'utilise pour la truite en saison et le crapet hors saison. C'est le tenkara que je pratique. D'après ce que je comprends, après avoir voyagé au Japon, interviewé des pêcheurs de tenkara de tout le Japon, pas seulement d'une région, j'en ai une bonne version et j'ai développé ma propre pratique à partir de cette méthode d'auto-enseignement. Je fais la promotion de Tenkara USA comme équipement et éducation pour les personnes que j'enseigne car dès le premier jour, Daniel Galhardo a bien compris. Ses méthodes ont créé une communauté très gentille et douce que je trouve attrayante. Si quelqu'un veut une canne japonaise, je vais l'aider avec une Sakura, l'ancien magasin de pêche et la marque qui a soutenu le tenkara au Japon dès le premier jour. Ils m'ont choisi pour les aider à promouvoir leur métier hors du Japon. Les cannes Sakura sont l'une des plus anciennes marques de tenkara au Japon et je suis fier d'en faire partie en tant qu'ambassadeur de cette marque. J'ai vendu à de nombreuses personnes ayant adopté le tenkara depuis 2010 leur première canne japonaise. Si quelqu'un veut une autre canne de tenkara japonaise, je suggère qu'ils visitent Keiichi Okushi de Tenkaraya. Il est un pêcheur de longue date et connaît tout l'équipement et les techniques du Japon. Il s'est approché de moi pour l'aider dans son magasin et cela a été un des points forts de mon expérience du tenkara. Cela et obtenir ma première tige de Tenkara USA, rencontrer de nombreux enseignants japonais et être invité à pêcher de nombreuses régions montagneuses du Japon. Donc mon idée du développement du tenkara dans le futur n'a pas changé depuis le premier jour parce que le tenkara au Japon a très peu changé. Mais une fois que le tenkara a quitté le Japon, comme l'a dit Masami, c'est à la personne qui le pratique de le faire à sa guise. 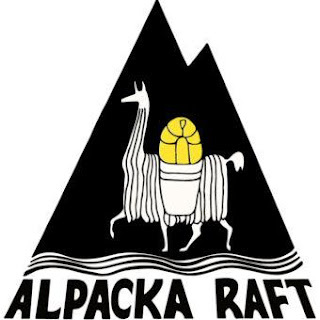 Avec l'aide des ambassadeurs de tenkara comme toi, Isaac Tait et d'autres personnes que j'ai mentionné précédemment, le tenkara vivra comme une manière douce d'explorer les eaux que nous apprécions. Il y a beaucoup d'autres qui promeuvent le tenkara qui sont gentils et courtois, ils sont trop nombreux pour mettre dans cette interview qui est déjà très longue. Christophe: Merci beaucoup Adam de partager tes points de vue très intéressants sur tout ce qui concerne le tenkara; tu es l'un des ambassadeurs les plus passionnés du tenkara. Je te laisse la liberté de conclure cette interview comme il te plaît. Adam: Le plaisir est pour moi Christophe. Si tu décides de visiter ma région, tu seras le bienvenu chez moi. Je veux que tu saches que j'ai apprécié ta participation au tenkara dans les médias sociaux et sur internet depuis que vous avez commencé à le faire. Vous êtes une âme aimable, le monde en général a besoin de plus de gens comme toi. En ce qui concerne le tenkara, il y a quelques bonnes façons d'améliorer votre tenkara et d'avoir du plaisir à le faire. Se rendre à l'une des écoles de l'Oni organisée par John Vetterli serait un bon moyen d'entrer en contact avec Masami Sakakibara, un expert japonais du tenkara. Son instruction va absolument améliorer votre tenkara. Le sommet de Tenkara USA est un grand événement, à la manière des sommets tenkara japonais, avec des experts américains du tenkara. Le sommet de Tenkara USA est un événement super amusant. Christophe, merci pour votre dévouement et votre gentillesse d'aider les pêcheurs à apprendre et à partager le tenkara, tu es mon ami un des meilleurs pour le faire.